Sign up on Eventbrite for this: Meetup AI/ML! 6:30 - Doors open. Networking. Beer & snacks. 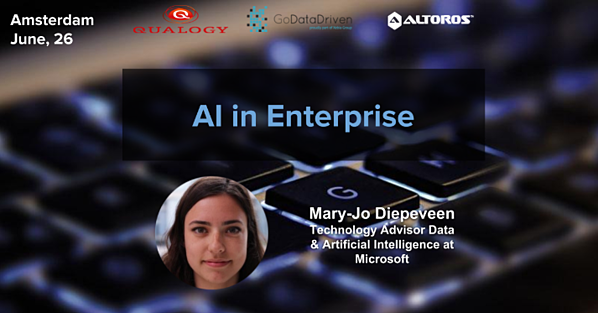 7:30 - NLP as the base of a chatbot implementation by Michael George Chaniotakis, Chatbot Engineer at ABN AMRO Bank N.V.
Speaker: Mary-Jo Diepeveen, Technology Advisor Data & Artificial Intelligence at Microsoft. We all know that Artificial Intelligence (AI) is the buzzword of the year. Whether it’s at an internal Microsoft conference, on the news or in a magazine: AI is mentioned everywhere. But what is it exactly and what is Microsoft’s AI story? You might encounter people that believe AI is for the far future and maybe a little bit scary. During our meetup we will show you that AI is already here and enabling people to do amazing things. We will give you a short & easy introduction to AI, help understand what it can do and show many examples of how consumers & enterprises are already using AI today to make their lives better. As a technology advisor at Microsoft, Mary-Jo teaches customers how to use data and artificial intelligence (AI) to become more productive and innovative. Her passion for AI comes from the times researching human intelligence, trying to figure out how the brain works and how it guides our behavior. By understanding the brain, models for AI which improve the technology we can use in many different scenarios are created. Now she focuses on finding the solutions made possible with AI, together with customers. Speaker: Michael George Chaniotakis, Chatbot Engineer at ABN AMRO Bank N.V.
Chatbots are now more than ever presenting in our everyday life. A lot of businesses are adapting this new methodology to their communication channels, in order to talk to and inform their customers on everyday basis. Artificial intelligence is growing day by day, letting us interact with customers in a more personalized and “human-like” way. Most of the chatbots had to face the understanding problem in order to deeply understand the needs of the customer, act and react as any agent in a specific (or many) task(s) and avoid mistakes. So, natural language processing, in most cases, is the base of a chatbot implementation. How is it made (in common sense)? How is it possible for the machine to understand human intentions? Come and learn what the needs are, how this is happening and why NLP is so important for a chatbot’s success! Michael George Chaniotakis is a BSc Honours Computer Science in Artificial Intelligence graduate from the University of Hertfordshire (2014). He worked as Software Developer, Senior Developer, Lead Developer & A.I Architect in Crowdpolicy over the past 3 and a half years, in Greece, creating crowd-resource, crowd-lending, crowd-funding and crowd-innovation platforms. The last four months, he is working at ABN Amro NL, as a Chatbot Engineer for the bank’s chatbot Anna. He focuses mainly on fuzzy logic, path planning (biological adaptation), natural language processing, decision-making, multi-agents systems and neural networks (unsupervised ANN). Currently, he is experimenting in Artificial General Intelligence (AGI). Favourite languages are C / C++, Python, Ruby, Java, Scala, JS (Node.js), LISP, & PHP.